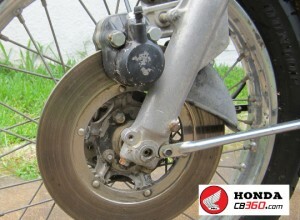 Overview: One of the major things that separates the CB360 from the CL and CJ360’s as well as the CB350 is the introduction a front disc brake. This Tokico single piston unit first showed up on the 1974 “G” version, however it became the standard for the CB’s during production. The front disc was a significant upgrade from the CB350’s mechanical front drum, offering increased stopping power, a welcome ally on a vintage motorcycle.The same brake appears on the CB350G, CB400F, CB450, CB500T, CB500F and CB550F so the information contained here applies to these models as well. The difference between the models is the length of the brake hoses in relation to the master cylinder. When ordering replacements make sure you pick the correct hoses for your specific model. This system can be troublesome for many to rebuild as decay often complicates matters. However, the front brake provides 80% of the stopping power on your bike, so let’s make sure it is working at its full potential. There are three areas to address: Master Cylinder, Caliper, and Brake Hoses. Master Cylinder: This is the FIRST part of the brake system that should be rebuilt, especially if your bike has been sitting for many years. Signs for rebuild include sticking in place, frozen, leaking or loss in pressure after sitting (handle feels squishy then firms up). A small set of snap ring pliers will make the rebuild easier. The inside of the cylinder should be scrubbed well with an oiled green Scotch brite pad on the end of a small rod. Once rebuilt, you can use master cylinder to disassemble the caliper. Must change parts: Master cylinder rebuild kit & cap diaphragm. Caliper: The pad and piston are typically stuck in the caliper because of corrosion. Unbolt the caliper, bleed the lines with fresh brake fluid and pump the rebuilt master cylinder. The hydraulic pressure in the system will pop out the pad and piston from the caliper. 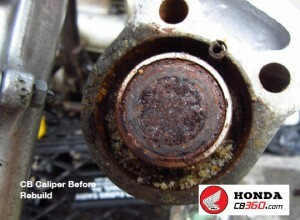 There is a 20% chance the piston is salvageable as they are usually pitted. The seal groove needs thorough cleaning (Dremmel tool with wire wheel works great) as does pad recess in the housing (sandpaper & scotch brite). Old brake pads should always be changed, no question. 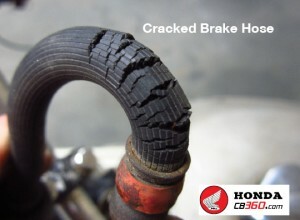 Brake Hoses: Usually I only see good original hoses on super clean well maintained bikes. Typically they are dry rotted, heavily cracked or leaking fluid. If any of these signs are present both the upper and lowers hoses should be changed together. For the Honda CB360 fresh rubber hoses are good, but braided stainless steel hoses are better and produce a noticeable increase in the stopping power of the bike. If you're working on a 450 model you can find the brake hoses for that model here. If your brake hoses look the picture to the right it's time to change them out. Always use fresh brake fluid from a sealed container. Lubricate the pivot pin on the caliper mounting arm as it’s typically seized; adjust the caliper drag screw accordingly. Lightly sand both sides of the rotor with some 80 grit sandpaper to remove the glaze prior to installing fresh pads. A light coat of caliper grease on the back of the pads and the inside caliper housing will keep things from sticking and squeaking. What are you referring to with the "caliper drag screw"
I am actually having the same exact problem as Sebastian, after rebuilding master cylinder, I added fresh brake fluid and opened the bleeder valve, pumped the brake, felt a little make its way down the hose, but then just stopped, the fluid just "jumps" up from the reservoir and nothing comes out the other end. A real bummer, cause I finally got this old 350f running nicely and I can't take her out for a spin till this is straightened out! Someone help us salvage these bikes! I have a 1972 CL 350K4 Honda that I am putting together. I stripped the front end off of a 1973 CB 350G so I could have the disc brake setup. My only problem I have is I do not have the 3-way fitting that goes on the lower triple clamp for the pressure switch for the brake light. I was thinking about using stainless braided lines and just trying to find a block that would work for the switch. I would have to probably have to have some lines made up due to the type of fitting that goes on these brake calipers. Do you have anything like this in your shop that you could recommend for me? I have an after market master cylinder and a reproduction caliper as mine was totally toast, but it exactly like the original with the inlet for a flared line fitting! Any info would be greatly appreciated, thank you!